A former banker turned Hollywood executive, Greg Feo 04MBA learned to merge his love of entertainment with his finance and marketing background while at Goizueta. 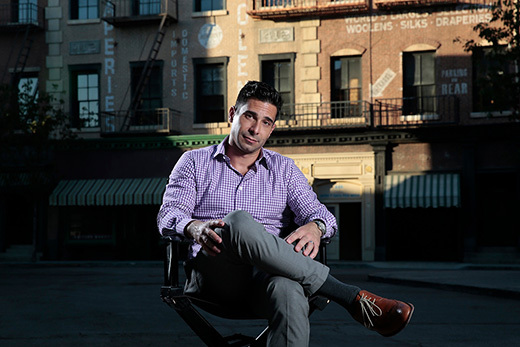 Feo, now executive director of film brand marketing at Warner Bros. Home Entertainment, is determined to beat the competition. He’s already executed campaigns for such popular titles as Mad Max: Fury Road, The LEGO Movie, and Harry Potter and the Deathly Hallows: Part 2. He chatted with Emory Business (EB) on the business fundamentals of films and the media consumption habits of millennials, “plurals,” and the rest of us. EB: Tell us about your role at Warner Bros. What do you like best about it? Feo: I handle the marketing and distribution of WB films when consumed outside the movie theater. That includes the purchase or rental through digital retailers and cable/satellite providers or buying the physical Blu-ray/DVD at a retail store. EB: How are the industry and those who consume it changing? Feo: The evolution of media entertainment is exciting and challenging. Netflix, Amazon, and Hulu are forcing traditional players to compete for consumer dollars. And as consumption moves to tablet and mobile, we have to be very creative. For example, how do you engage on tablet and mobile when your product is 120 minutes long? I’m working with engineers to develop a better cinematic experience on a tablet. We’re always rethinking models. Take millennials and plurals [ages two to 17]—they equate access to content the way past generations might think about ownership. So they are more interested in a subscription model like Netflix. EB: Before getting your MBA, you worked in finance for a few Wall Street firms. How did graduate school help you follow your passion? Feo: I knew banking wasn’t for me very early on. At Emory, I knew I loved marketing courses, but I wasn’t interested in working at a traditional consumer packaged goods company. The creativity and dynamics of the entertainment industry always held an attraction for me; fortunately my banking skills, supplemented by my MBA, were transferable to product marketing. Both fields require the ability to understand a profit and loss statement—you need to understand the numbers and what goes into them. It’s another facet of creativity. My MBA helped me to land a marketing internship with Turner Entertainment, which was my foot in the door of the industry. That was my first step in a career change that led me to marketing opportunities at companies like MTV [a result of cold-calling a fellow Goizueta MBA graduate], Walt Disney Studios, and finally Warner Bros.
I’m so glad I took this path. Home entertainment is the intersection of product marketing and entertainment. Every film has a target audience and needs a positioning statement and a marketing campaign. I get to do what I like in a sector that interests me. EB: How do you relax when you’re not working? Feo: When not watching movies, my wife, Michelle, and I love spending time hanging out with our two beautiful daughters. I’m also a gym rat. I guess that’s a product of living in the “glamour” of Los Angeles. That’s how it is out here. This story was originally published in Emory Business.